GX0OOO/P SOTA G/TW-004 on 160m CW/ SSB, 80m SSB & 20m CW. IC706-2G HF-VHF-UHF QRO Multi-mode Transceiver. Insertable loading coils with slug tuning for 160m (at 40m break points). This is the closest SOTA to my home QTH and a 40 mile round trip from Scarborough. The A166 road out of York runs east/ west right through the activation zone and there are further operating choices in the form of minor roads north and south. The trig point is immediately to the north of the A166 but we usually drive SSE down the Roman road and park the car on the wide grass verge for VHF at SE 8240 5675, which is just inside the more sought-after 94 square (IO94PA). I set up the HF station in IO93PX which starts a few yards further down the road at around SE 8242 5673. As he planned to do the RSGB 70MHz contest which runs from 20:00 to 22:30, my son Philip G0UUU invited me along to do the SOTA, an opportunity I welcomed unreservedly. 160m came to mind of course, in fact Phil suggested it. The contests liven-up the otherwise dead VHF bands starting with 144MHz on the first Tuesday of the month, 423MHz on the second Tuesday etc. 50MHz is slotted in between these two on a Thursday and 4m the Thursday after. Both Phil and I have transverters for 4m as recommended by Andy MM0FMF. They are made in Ukraine and run just 10W from a 5W or 2.5W input on 28MHz. To go with these I made us a 3-ely Yagi beam each; literally a G3CWI SOTA beam scaled up to work on 70MHz. We set off from Irton, Scarborough at 18:40 in Phil’s car and arrived at 19:20 inside the SOTA activation zone, on the ‘C’ road (Roman road) which runs SSE from the A166 as described above. I first helped Phil set up his mast and 3-ely beam on a short mast supported by guy lines. 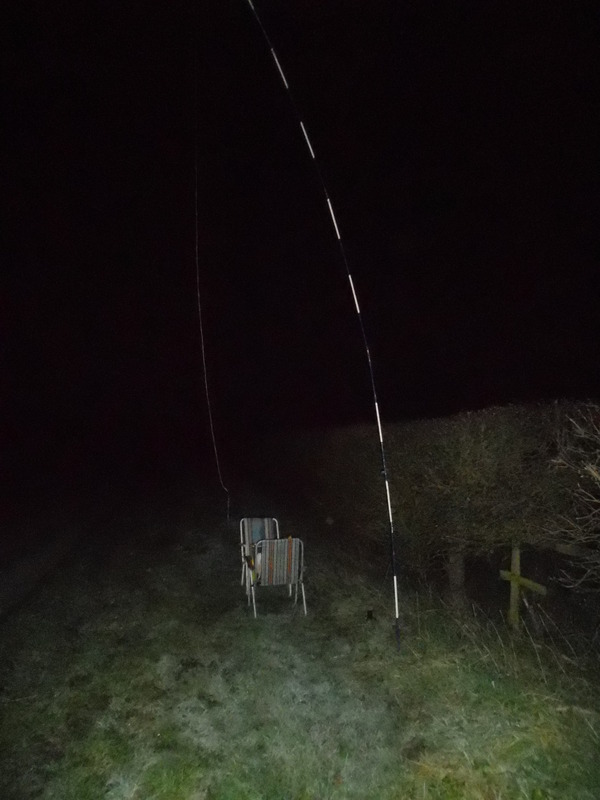 Wearing a headlamp I set off down the road on foot with my mast, HF rig, battery and two folding chairs until 100m separated me from the 70MHz VHF station. This SOTA is ‘not for real’ or so it feels and you can take almost anything in the way of equipment safe in the knowledge that it won’t have to be carried far, if at all. For this reason I brought my 6.8m mast and the IC706-2G which has 100W. Given more time I could easily have set up my 11m home-brew carbon mast, the one we use for GB stations; a thought for future reference perhaps. The 6.8m mast and link dipole were erected leaning outwards from a very prickly hedge but while doing this I stepped back in the dark and smashed the antenna spool instantly creating another job for me! 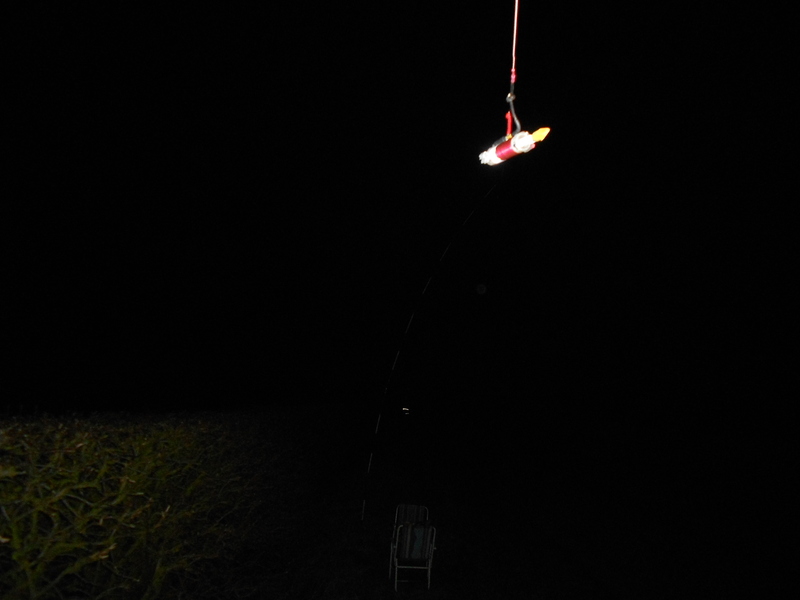 The hedge is over 2m high and it makes a good tie-off for the dipole ends, the feeder coming down to a garden chair with a second chair for the operator. First job was to insert and tune the 160m loading coils before removing them for safe keeping until later in the evening, after which task the 20m links were pulled. I calculated in advance that the 5th harmonic of the 14MHz CW sub-band would fall into the 70MHz SSB section but that 20m SSB would be clear of the 4m band altogether. As for Top Band the only worries were the 38th or 39th harmonics which would likely be too weak to bother about. G/TW-004; BISHOP WILTON WOLD, 246m, 1 pt, 19:20 to 22:45. 9 Deg.C, zero wind. Overcast. No rain or low-cloud. WAB: SE85. Locators: VHF: IO-94-PA; HF: IO93PX. (Trig point TP-6078 was about 500m away, therefore not valid for this activation). Fair Vodafone coverage – 4G at times. To save walking the 100m between us at various points in the evening, I supplied Phil and myself with UV-3R 2W handhelds. Later we moved to 145.200 to avoid a local net. Since we were both in the activation zone this does not count as a SOTA contact; neither does it appear in the database. A year ago and at a later time than this, there’d been success on 20m from this summit. Three stations were worked and two were USA chasers. However, it didn’t take much investigation to conclude that the band was to all intents and purposes closed this evening. Nevertheless, 20m had been alerted and therefore an attempt would be made. After a self-spot with poor phone coverage which did eventually work, a few CQ’s brought nothing until a 599 signal suddenly appeared in the form of Phil G4OBK in Pickering, 28km to the north. Phil’s report to me was 589 but he told me that something was amiss and my signal was somewhat intermittent. Later I noticed that one of the 20m dipole links looked a bit close and might possibly have been in contact. Phil spotted me again but the band just wasn’t supporting anything other than line-of-sight contacts so it was now time to move on. The moving-on was initially going to be to 7.032 CW but flicking through the rig’s memories reminded me that QSO’s might best be forthcoming on the 80m WAB channel, though it was empty when I got there. Not knowing whether my self spot had ‘taken’ or not, Karl 2E0FEH came straight back to my CQ with 57 both ways and the frequency quickly livened up. 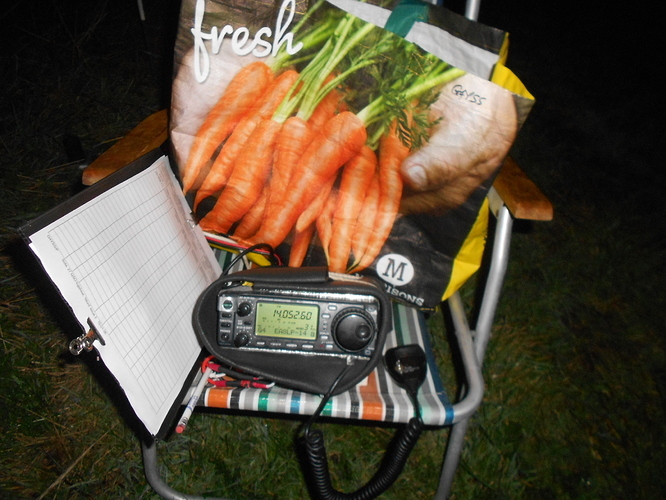 Stations worked after Karl: G0VWP Terry, York; GB50WAB - op Graham (G7LMF) in SJ61 Telford; G4OOE Nick in Scarborough; G4OBK Phil, Pickering; MM0GGI John, Kylesku; G8ADD Brian, Birmingham; MI7JMN John, Ballymoney. 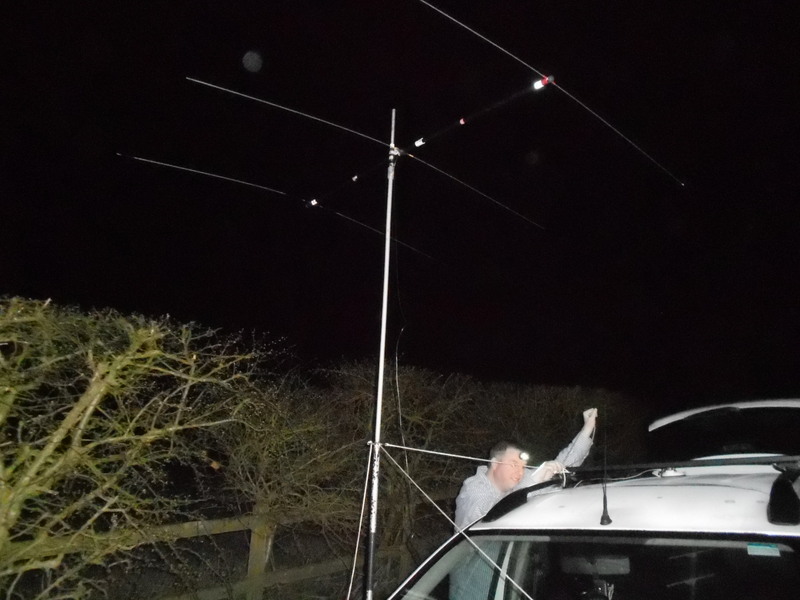 Continuing: EI3GYB Michael, Mayo; G7AFM Phil, Hereford; G4BYY Keith, Hampshire; G0RQL Don in Devon; SM6CNX Dan; G8VZT Dave, Telford; GW4VPX Allan, Pencader (hurriedly working on his Top Band antenna arrangements); G4IPB Paul at Middleton-in-Teesdale; G4HPE Steve, Royston TL24 and G6NHW Pete in Birmingham. Conditions were really good. All the above were between 59 and 59 plus 30dB to me and no less than fourteen 59’s came back, along with two 57’s and a 55 from Nick G4OOE who, living by the hospital, has massive noise problems. Power was 100 Watts for the first two thirds of the session and 80W after that. I say ‘100W’ but in fact that would only be realised with 13.8V applied. Max voltage for a 3-cell Li-Po is 12.6V. Several ops said, ‘I’ll be listening for you on 160.’ All that was needed now were as good conditions on Top Band as had been enjoyed on 80m. With five minutes left to fit the coils, timing was perfect. 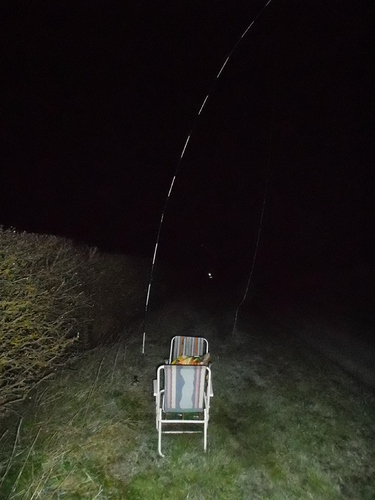 First in without delay at the advertised time of 21:30 was Victor GI4ONL with 589/ 579; an early indicator of at least reasonable band conditions. Next to call in: GW4VPX Allan who had evidently done a great job on his Top Band antenna (589/ 559); G4OBK Phil (2 x 599); SA4BLM Lars (559/ 339) and DJ5AV Mike (589/ 569). Power was set at about 80W and the session took us to 21:38. I thought there’d be further callers but SSB more than made up for it. On switching over I heard voices on the channel, then they disappeared. Luckily when I checked ‘Is the frequency in use?’ I found that the voices belonged to chasers waiting for me! First in was G1YFF. I’ve heard from my son Phil and I also know first hand that Jake is another really keen Top Bander. The exchange was 59/ 57. Jake gave me the choice of a WAB style run-down with himself as controller or a free run. I chose the former as it’s something I’m used to. When we worked on 3.760, Karl 2E0FEH had mentioned that there was a WAB gathering on 1985 kHz but it would have meant significant work retuning the 160m coils. With that in mind, I hoped that the members of this net would all be capable of coming down in frequency to work me. It didn’t take me long to realise that on the one hand conditions were exceptionally good and also that there was going to be quite a queue. I think it must have been Karl who tipped-off the 1985 net. Down to further business: G7AFM Phil (59/ 58); SM6CNX Dan (2 x 57); GB50WAB Graham (2 x 55); 2E0FEH Karl (57/ 55); G8VZT Dave (2 x 55); G4BYY Keith (59/ 57); GW4VPX Allan (57/ 44); EI3GYB Michael (57/ 55); GI4ONL Victor (57/ 55); G8ADD Brian (53/ 56); G0RQL Don (2 x 57); F6GCP Pat in Paris (59+10dB/ 57); G0VWP Terry (58/ 51). Continuing from 22:00: ON7ZM John (59/ 54); GX3JRM Lowestoft Radio Club with op James M1TES (58/ 55) in TM59; G4IPB Paul (a massive 59+20dB/ 59); G8VNW Nick in Threshfield (57/ 47); G3RMD Frank in Cheltenham (59/ 55); IK0NMJ Walter nr. Assisi using ‘an 80m vertical’ (58/ 57); GI0AZB Ian - 2 x 59 (Esther GI0AZA was not well but on the mend); YL2GB Wal (Valery) (59+5dB/ 59); EI2KD (M0ZXZ) Rod (2 x 59). The first six stations were worked with 80W; the remainder with 50 to 60W. Because of the good conditions (if a little noisy) and the unusually great number of stations worked, this was a very enjoyable 40 minutes. After all, it was only a one-pointer and I imagined that many people might have been watching the news etc. It was really good to see this level of interest in 160m; a band still seen as special by many, myself included. At 22:18 I finally went QRT satisfied. By the time my station was back in kit form I was just in time to help Phil take his 70MHz VHF antenna down. He had logged 34 QSO’s up and down the UK, just failing to get his 10 Watts into PA and GD. Nevertheless, this was an improvement on his first 4m evening when only 13 QSO’s were worked, albeit from a different location. The only harmonic (a fifth harmonic) from me to Phil, was heard on 70.262MHz. Phil was working a contest station on Sutton Bank at 20:33 and this corresponded to the time of my QSO with G4OBK on 14.052.6MHz. Since the CW was only coming through at 529 and Sutton Bank had a big signal only 30 miles away, no real interference was caused. This was predicted and it seems that 100m separation between the two stations was sufficient. Last year there were none of these interactions between 14MHz and 432MHz and nothing detected on 4m from 80m or 160m this time. Last year I had to get out and push but this time the car came off the verge at the first attempt. Could be the new tyres? At 11:15 pm Phil dropped me off at home in Scarborough, with plenty of enthusiastic information swapping on the way. We’d both had a very successful evening and SOTA’s don’t get any easier than this. Ascent/ Distance: 0m/ distance 2 x 100m. Best DX for the evening was Italy and that was on 160m SSB! That distance wasn’t expected so conditions were proved good. Roy G4SSH has enjoyed great success from this summit in 2012 and 2018. He would otherwise never have activated anything, though I did manage to get him down into OV00 way back in 1987! While on the subject of Roy. He is not in good health. After his holiday to 5B was cancelled at 24 hours notice, he ended up in a local residential home in Scarborough, called Combe Hay. This is intended to be a 2-week stay while central heating and a new bathroom is installed in his house. I have been to see him several times and worked him on 2m at short range. Many thanks for the good wishes for Roy added to my last report and thank you to Andy MM0FMF and the SOTA management team for the get-well card, which judging by his reaction meant a great deal to him. We shall see what the future holds and hope that Roy can return to something approaching normal living. After 150,000 chaser points, they’ll be missing him on the CW bands! Thanks to SOTA & WAB chasers, WAB control/ assistance plus other stations from further afield. Also to the spotters: G4OBK; GI4ONL; 2E0FEH and the SMS spotter. Thanks also to 2E0FEH for DX cluster spots on 160m and for alerting the existing net on 1985kHz. Thanks to Phil G0UUU for inviting me along and here’s hoping we can do it again next year. Above: The SOTA HF station set to 14 MHz. Note the ‘rucksack.’ Is this really a SOTA? 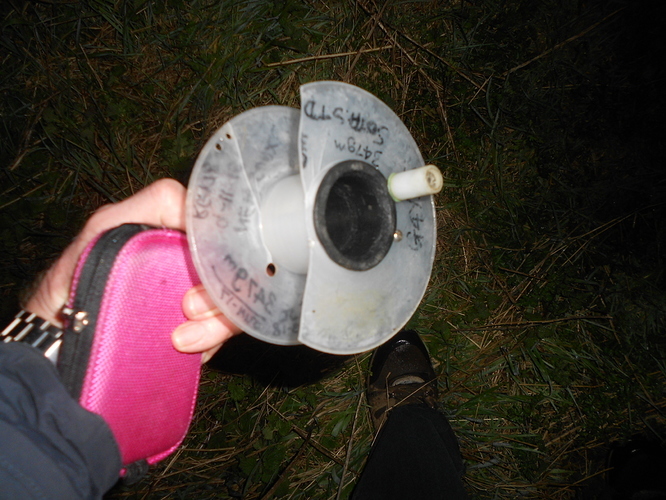 Above: The broken antenna spool. Clumsy me! Above: Yet another photo of a Top Band coil. Thanks for the report and pics. Great to get you in the log on 160m cw and ssb. I’d put up just over 40m of wire endfed with 9:1 UnUn a few hours before you came on air. It wasn’t very high with a dog-leg but loaded perfectly on Top-band. It’s years since I’ve used the band but really pleased with the result. Thanks for giving me the incentive to re-visit the band…plans already in place to get it up a lot higher. Your contact was my 26th with G/TW-004 and brought back memories of my many s2s with the late G4ASA Dave who would often go out to Bishop Wilton Wold to get me and Barry M0IML when we were up in the Lake District or Pennines…must visit the summit this year and also complete G/TW. Thank you for your reply and the160m QSO’s. Your 40m of wire was putting out a respectable signal and higher will be better still. It would help being a quarter-wave on the band, no doubt your intention. You must have had something else when I worked you from TW4 on 160 last year (2018). I used to have a half-wave dipole up for Top Band but that had to be slightly folded at one end due to the plot being 200ft. It was at 36ft in the centre, 25ft at the ends and got out well round the UK. It now hangs in the garage gathering dust. I used it to work Nick G4OOE in Cyprus when he was ZC4EE but Roy and I had to wait until after midnight. It sounds like you and 160 have had a past too. It’s a good band but it’s hard work in daylight. Just think, before our time it was the /M band with massive base loading coils! Thank goodness for improved 2m equipment. 26 x TW4 QSO’s!! Amazing. So now you need to activate it! With luck and a following wind, I might just make it from here on 2m-FM. Sounds like you might be a regular on 160m in future. Good stuff!